The traditional tale of Noah’s Ark features animals going in the ark two by two, but in Noah and Nelly in Skylark the animals find themselves going in two by one. Helmed by the red bearded Noah and his knitting obsessed wife Nelly, the Skylark is a floating ark which uses a giant pink balloon to drift across the skies. The animals on board are curious creatures with an optimistic head at one end and a more pessimistic head at the other end. Along with Humphrey the pigs, Ahmed the camels and George the rhinos, Noah and Nelly embark on a series of absurd adventures that feature them rescuing loose change from the clutches of wild gambling cards, trying to fly a knitted flag on the moon and visiting Cuckooland where all the cuckoos have migrated south for winter. Presented by Roobarb Enterprises and produced by Bob Godfrey Films Ltd, Noah and Nelly is clearly indebted to the world of Roobarb with Richard Briers again providing the narration, although this time there are additional voices provided by Peter Hawkins. Certainly not as iconic as Roobarb due to the main characters struggling for a unique identity, Noah and Nelly does, however, have a curious collection of surreal adventures on its side. As with Roobarb, George Calveley created Noah and Nelly as well as writing all 29 five-minute episodes while Bob Godfrey acted as director. The episodes first aired in 1976 on BBC1 in a daily 5.35pm slot; repeats continued up until 1980 on BBC1. 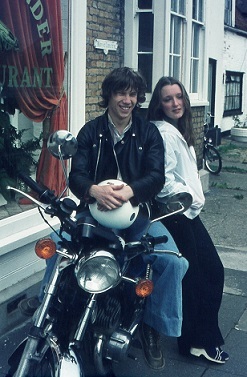 Kerry (Peter Duncan) is on a quest to become a top speedway rider and genetics are certainly on his side as his father Richard Hutson (Tony Caunter) – known as King Cinder in his heyday – was a champion rider. Kerry’s current dream is to ride for his local speedway team The Barton Barons where his brother Trevor Hutson (Jeremy Arnold) is already finding fame. However, a dark cloud is racing onto the horizon in the form of Todd Edwards (Michael Hawkins), a wealthy, smooth talking crook who holds a long term grudge against Kerry’s father. With his faithful girlfriend Nikki (Lesley Manville) by his side, Kerry aims to risk everything to protect his family and get even with Edwards. Featuring real life couple (at the time) Peter Duncan and Lesley Manville, who had met at the Italia Conti stage school five years previously, King Cinder was a BBC children’s drama written by John Foster. Part of a new wave of gritty British children’s dramas, King Cinder is to be commended for mixing blackmail, violence and kidnappings with teatime drama. The crime element of King Cinder, of course, should come as no surprise as Foster would go on to write for crime dramas Z Cars, Juliet Bravo and The Bill. Comprising six 25-minute episodes, King Cinder was broadcast in the BBC1 5.10pm slot of Wednesday evenings towards the end of 1977. 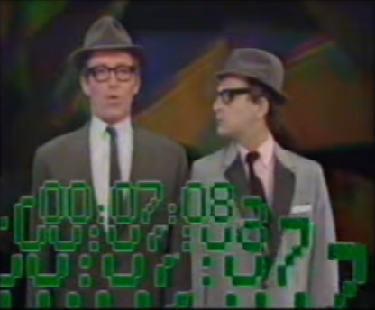 A single repeat airing of the series came in the summer of 1979. Alan (Alan Rothwell) and Jan (Jan Harvey) are the hosts of Daisy, Daisy, a series which takes a look at the wonderful world of mundane, everyday objects and the fun that you can have with them. Helping the human hosts are their two puppet friends Wriggler (a worm with technicolour hair) and Splodge (a typically slow snail). Casting their eye over a variety of objects such as brushes, mirrors, wheels and fruit and veg, the Daisy, Daisy team can, for example, find themselves fashioning a hobby horse out of an old brush for all manner of bristly fun. In amongst these activities, there’s time for a spot of blacklight puppetry, regular animations which feature Simple Simon and even a quick bit of rhyming magic. Despite having all the requisite hallmarks in place to succeed as a helping of classic children’s TV, Daisy, Daisy never quite manages to marry its storytelling, activities, learning and puppets into something more substantial. Although it’s all harmless fun, it’s far from iconic and pales in comparison against contemporaries such as Rainbow and Hickory House. 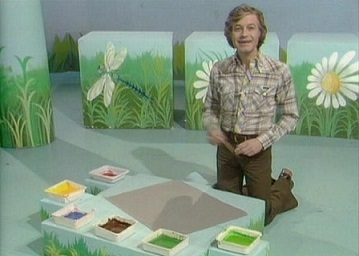 In total, 27 20-minute episodes of Daisy, Daisy went out daily in rather haphazard weekly blocks as part of the lunchtime children’s slot on ITV. Penning the scripts for Daisy, Daisy were Granada regulars Barry Hill (Coronation Street) and Anne Mountfield (Our Backyard). Episodes of Daisy, Daisy were repeated on ITV up until 1980. Pulling off that rare trick of combining comedy with learning, Eureka has fun written through it like a stick of rock thanks to the fantastic cast at its disposal. Relatively early in the rather fresh-faced Jeremy Beadle's career (he also co-wrote the first series), it's also interesting, with hindsight to watch his early steps along with Sarah Greene's. Eureka was written, produced and directed by the multi-talented Clive Doig who also worked on Puzzle Trail, Jigsaw and The Phoenix and the Carpet. Episodes of Eureka first aired in an early evening BBC2 slot before being repeated on BBC1 in the late afternoon children's TV slot. 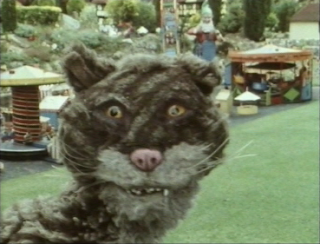 Tea Time Television finds mangy, puppet cat Scragtag living in a chest of drawers situated out the back of a secondhand shop. Whilst digging through all the various wonders and junk of the yard, Scragtag discovers an old TV which transmits T.T.V, a curious collection of quizzicals, stories and cartoons. Stories featured include the illustrated adventures of Peregrine Piecrust and perhaps the most memorable cartoon is Mr Hiccup, a bizarre import featuring a man with chronic hiccups. It’s not a solo adventure for Scragtag, of course, as he’s joined by Tim, a gnome made of stone who is completely mute. Scragtag and his Tea Time Telly rejigs the format slightly and finds Scragtag separated from his beloved chest of drawers. An epic quest up and down the country ensues and gives Scragtag the opportunity to visit plenty of schools and tell corny jokes to the pupils. Scragtag, himself, is a fantastic creation all packed full of attitude and low-rent aesthetics and, on the whole, his programmes are entertaining affairs with Peregrine Piecrust and Mr Hiccup providing a healthy dose of the surreal. The quizzes featured are, yes, rather mundane, but they're aimed at the lower end of the age spectrum, so demanding anything more taxing would be absurd. Scragtag was created by Marcus Kimber who had previously worked as a Punch and Judy man as well as designing many of the puppets seen in The Young Ones. 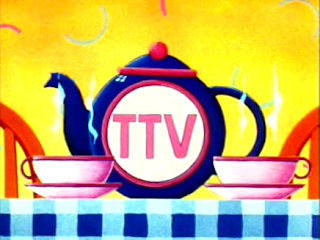 Two series of Tea Time Television / Tea Time Telly were produced by Roy Milani between 1985 and 1986 with 41 20-minute episodes being produced. 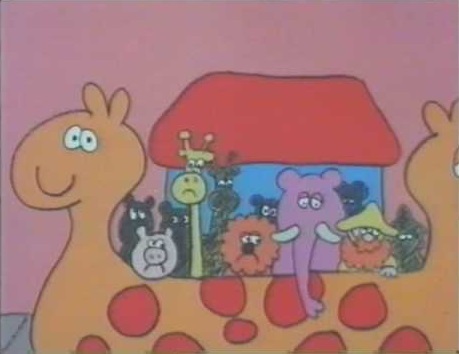 Both the first and second series opened up the late afternoon Children's BBC slot. Only Tea Time Telly was granted a repeat airing with this coming in mid-1988. Pinny is small wooden doll, so small that she's comparable to a pin, hence the imaginative name. Her abode is a rather delicate china house which sits atop a shelf beside a model sailing ship. 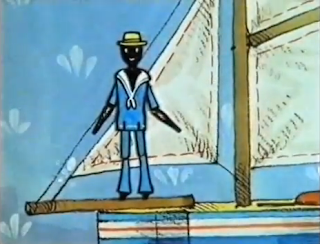 Manning the ship is Victor, a pin-sized sailor, who's found himself stranded on land, far away from the high seas. The dolls are regularly played with (and introduced to trouble) by their children owners Tom and Jo. Episodes find Pinny and Victor falling into a salad where they encounter a caterpillar amongst the lettuce leaves, Pinny has to chase spiders and beetles out of her house and Pinny even experiences the ignominy of being mistaken for a twig by an industrious, nest building bird. The jeopardy facing Pinny within Pinny's House is a curious blend which, although incredibly slight, manages to conjure up narratives that are packed full of magic. Mirroring the giant world that young children also face, Pinny's House provides a relatable landscape for viewers and is backed by a fantastic folky/sea shanty soundtrack delivered by Welsh band Ar Log. Pinny’s House ran for a single series of 13 episodes which ran for five minutes each and was the final production by Smallfilms.. Written by Peter Firmin, co-founder of Smallfilms, the series initially aired as part of the Children’s BBC line up in a 3.55pm timeslot. Episodes were later repeated in morning and early afternoon timeslots up until 1993 when it received its final transmission. Down at the bottom of the garden, near the shed, is an old broken sundial which is home to a curious collection of insects and arachnids. Living on this ancient time telling device are Mr Harrison the snail, Lambeth the beetle, Ariadne the spider, Ladybird the ladybird, Ancient the caterpillar, Anorak the pillbug and Suppose the worm. When they’re not rallying round to free Ladybird from the sticky trappings of a jar of jam they can just as easily be found dealing with rigours of a garden that’s lost its grip or watching Suppose traverse the garden in his jumping suit. A triumph of animation and intense charm, Creepy Crawlies is a trademark slice of stop-motion animation from Cosgrove Hall. Admittedly, it’s not quite as engaging as more legendary Cosgrove Hall productions such as Chorlton and the Wheelies or The Wind in the Willows, but it cleverly taps into that childhood fascination of all things creepy and disgusting. 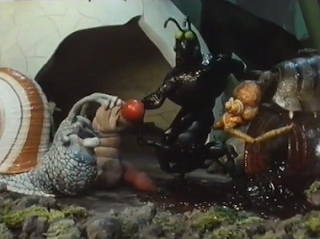 Three series of Creepy Crawlies were produced with a total of 52 10-minute episodes airing in the 4pm slot on Children’s ITV. All the episodes were written by Pete Reeves (Cockleshell Bay, Count Duckula, Bob the Builder) with Francis Vose and Brian Little sharing the directing honours. And that's it for this particular edition of The Forgotten World of British Children's TV, but don't despair as I'll be back soon with more hazy memories. I enjoyed Creepy Crawlies and still call beetles Lambeth when I see them. Was narrated (and had theme tune sung by) Paul Nicholas as I remember. King Cinder is quite sort after by the UK Speedway fraternity.I can just about remember seeing it as a nipper! Bit behind on adding my comments but loving those wonderful mini-compendiums of the more forgotten and obscure offerings from the era. Oddly I don't remember 'Noah and Nelly in Skylark' which is odd as I was/am a huge fan of both 'Roobarb' and even moreso of 'Henry's Cat', both from Bob Godfrey. I was born in 1978 so no doubt may have seen those 1980 repeats but unlike other early TV memories just don't recall it. Either way, 'Henry's Cat' often falls into the shadow of 'Roobarb' but is a great series (especially the slightly longer episodes); an article on it would be very welcome indeed. Likewise I can't recall 'King Cinder', although do know of it due to the Peter Duncan/'Blue Peter' connection. I've thought before but the classic BBC1 5.10(ish) dramas could well do with their own detailed article or two as there were some true gems over the years. 'Daisy, Daisy' just sounds very generic to ever have become memorable or to last than long; although that's never stopped various other TV series having curiously longer than imaginable runs over the years. I recall really liking 'Eureka! ', it was from the days when things were actually quite intelligent for children, before they felt to be dumbed down a little bit in the 1990s. It's also pretty amazing to look back and see just how many kid's TV show of the age Sylvester McCoy was involved with before he become known as 'Doctor Who', as he's not a name than most would readily offer up as a key part of the programmes of the era yet he was involved in quite a number. 'TTV' was (along with 'Bad Boyes') the little-remembered programme that first bought me to this wonderful site. I've left my many memories (including recording an episode or two on my old tape recorder as a young boy) on the site's dedicated article for the series. I recall liking 'Pinny' House' or rather, my mother liking 'Pinny's House' and watching it with her when I would get it from school. It was very basic with an old fashioned feel and that was doubtlessly it's charm. 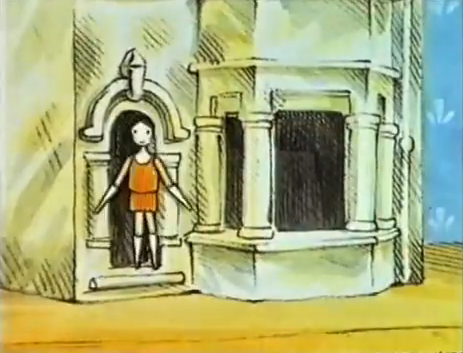 It did blur in our memories slightly over the years with the much darker 'Tottie - The Story of a Doll's House', due to them both having a doll's adventures theme; thankfully the likes of YouTube and a few websites of this have helped clear the memory clouds. I don't remember ever watching 'Creepy Crawlies' but can remember it being part of the Children's ITV line-up. No doubt it clashed with something on the other side, or just didn't appeal to me for whatever reason. By the way... Where is the TTV screen-grab from; is there an episode (or part) lurking on-line, as I've searched several times for one. There was a clip from the end of one show were Scragtag meets Phillip Schofield at the end of one episode on YouTube a few years ago, but sadly I believe it's long gone and I never grabbed a copy. I found that screenshot online several years ago. It may have come from the episode you mentioned originally. Unfortunately, I never saw the episode that was up on YouTube! Scragtag footage is sadly very rare!